An Investment Policy Statement describes the investment philosophies and investment management procedures to be utilized for the investable assets as well as the long-term goals for the investor. 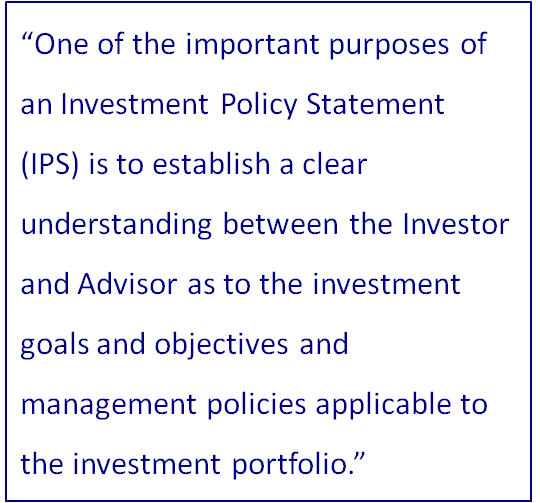 This agreement should be reviewed annually by the Investment Committee and the Investment Advisor to insure that the underlying portfolio is properly aligned. 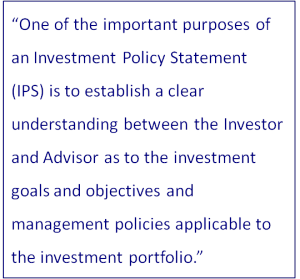 The principal reason for developing an investment policy is to enable you and your advisor to protect the portfolio from ad hoc revisions of a sound long-term policy. Without an investment policy, in times of market turmoil, Investors are often inclined to make impromptu investment decisions that are inconsistent with prudent investment management principles. Your investment policy is intended to provide a well thought out framework from which sound investment decisions can be made. Establish the Investor’s expectations, objectives and guidelines in the investment of the portfolio’s assets. Create the framework for a well-diversified asset mix that can be expected to generate acceptable long-term returns at a level of risk suitable to the investor. Specify the target asset allocation policy. Is this Strategic or Tactical? Establish Investment Guidelines regarding the selection of securities, investment managers, and diversification of assets. How much risk should be assumed by each position. Define the responsibilities and relationship of the Investor and the Advisor. Encourage effective communication between the Investment Manager and the Investor.